How things can change in a year. Fourteen months ago Sarah Reeve was living in Buderim with her parents, loading music on to her MySpace page and hoping someone would have a listen. 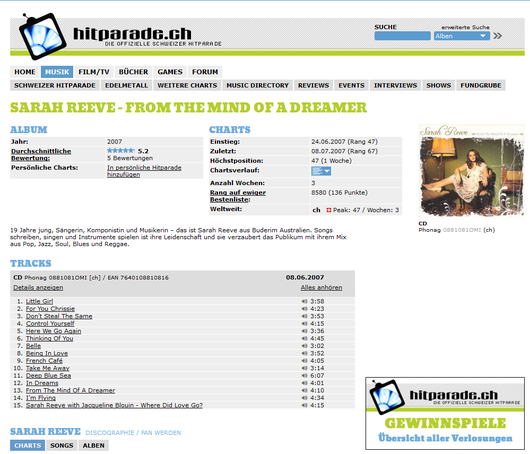 Today she has a Top 50 album in Switzerland, one week after it debuted on the charts. When she learnt From the Mind of a Dreamer was among the top-selling albums in the country, the 19-year-old said she was “overwhelmed with joy”. “I burst into tears,” she said via email from Switzerland. Sarah said she knew she’d hit the big-time when she heard one of her songs on-air for the first time. “I had just got back to my manager’s place and we were all talking, and all of a sudden in the background I heard a familiar song and I screamed and jumped in the air. Just after her debut album hit the charts, Sarah scored an interview with the highest-rating radio station in Switzerland, which has around one million listeners. Her big break came last year, when she was approached by Swiss manager Oliver Meyer, who had listened to her songs on the My Space website. She’s since been to Switzerland twice, to record and subsequently promote her album. Sarah’s next plan is to build up a fan base in Australia, but she said it was difficult to know where she’d be in five years. “Life is so unpredictable, but my dreams for myself are to inspire as many people as I can. Sarah said without self-belief, she wouldn’t be doing what she’s doing today. “I remember when I was at school and people would ask me what I was going to do with my future. I always said I was going to be a singer, and that I would make it some day because I really believed in myself.